Turns out the Kingsguard isn’t that great at keeping out gatecrashers (probably because they’re led by a one-handed man): Deadline reports that last Sunday’s Game Of Thrones set new records on the peer-to-peer service BitTorrent, with some 193,000 users sharing a single copy of “The Lion And The Rose” following the episode’s debut. That’s a significant increase over the 171,500 shares of the show’s season-three finale, a tally that helped the show become the most-pirated TV series of 2013—not that it did anything to mitigate HBO’s impression that kids today will eventually tire of getting their Westerosi for nothing and their Game Of Thrones for free. That’s the kind of confidence you can affect when your show is still a reliable winner on the home-video circuit, viewers scattered across the seven kingdoms are crashing the HBOGo server because everyone’s sharing the password for the account mom and dad set up in King’s Landing. 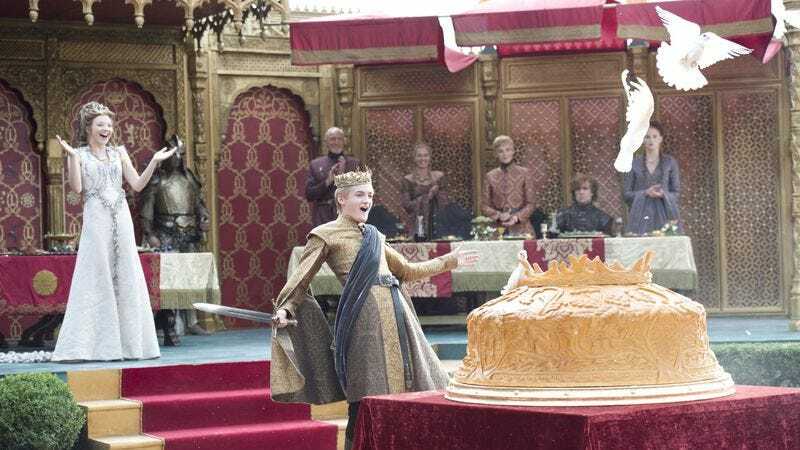 All told, 1.5 million BitTorrent users heeded the call of “Oh look, the pie!” through Monday evening, demonstrating that Game Of Thrones continues to capture the cultural conversation by ending an episode with a major, far-reaching event. You know, like a wedding.